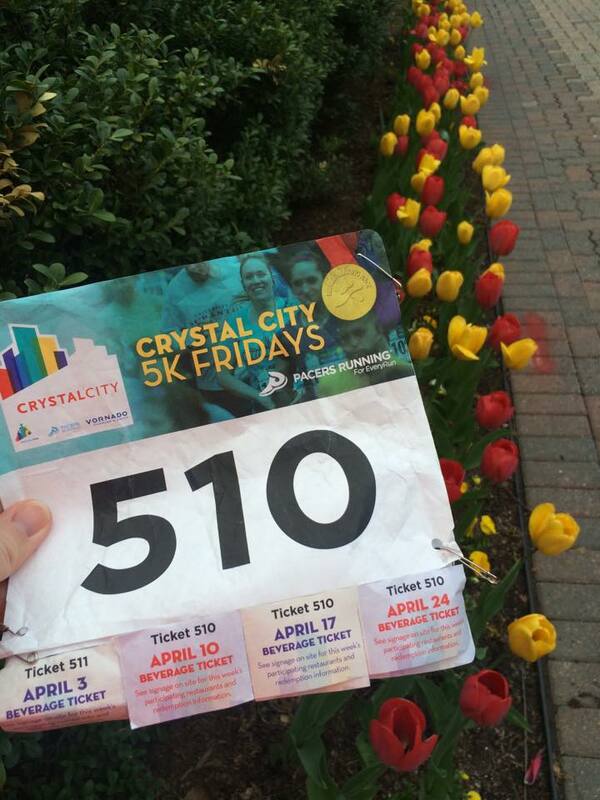 Like most races I sign up for, I didn’t actually intend to register for the Crystal City neighborhood of Arlington, Virginia’s most exciting month of the year event in running: the Pacers Crystal City 5K Fridays that happen every Friday in April. I’ve run this race course before, once in 2011 on the third Friday of that April, and I usually don’t run races that I have already run before simply because there are so many out there to experience. The only exception is if I really love the race, then yes, I would run it again. And I don’t particularly looooove this race, except that it’s great for shaking off winter race cobwebs. It’s right after work on a Friday which makes it really hard to get to, plus I am trying to start practicing consistency ahead of training for the 2015 Baltimore Marathon which will include Fridays as my designated rest day, so having to push that back to run 3.1 miles for another month was slightly annoying to me. Why did I register? Because my friend Kristine, one of my longest friends out here with whom I bonded over my failed attempt at the training for the 2010 Philadelphia Triathlon when I was part of Team in Training, was just coming back from an injury and needed to get out there and get back on the running horse. Plus, I wasn’t in DC in 2014 and I can’t lie that a random chat message from her last year telling me she wished I was there to run the course with her sort of stuck with me. But once I hit “register” on the Pacer’s website and forked over my $60 to run four 5Ks, I felt excited that I’d have this to look forward to every week in April. The first race happened on Good Friday of Easter weekend. The evening was a typical warm spring day, but cool enough to need a thin, long sleeved running top with shorts. We were almost expecting rain, so the fact that the race was happening was a good thing. The crowd was lively but kind of small. I liked it that way. I wasn’t sure how I was going to run, considering I had a long run planned the next day. But it’s hard for me not to take a race seriously. Once the gun fired and we took off, I started feeling nauseous. I was running a slower pace with my friend and I was happy with it. I realized this race was not going to be for time. Around mile 1.5, the waves of nausea almost made me stop along the way. Any race during which you have to say Thank God it’s just as in Thank God it’s just a 5K means it will still be a long way to the finish line. Fortunately, almost just as I thought that, the nausea stopped and I felt ready to pull ahead of the crowd and go a little faster. This is where Kristine and I parted ways. For the rest of the race, I tore up the course. I started passing other runners, feeling tall and running strong. 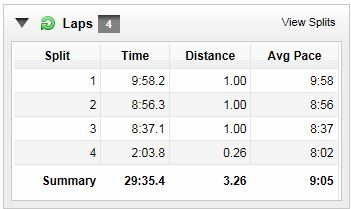 My pace was down near 8:17 as soon as I passed the third mile. I felt great. 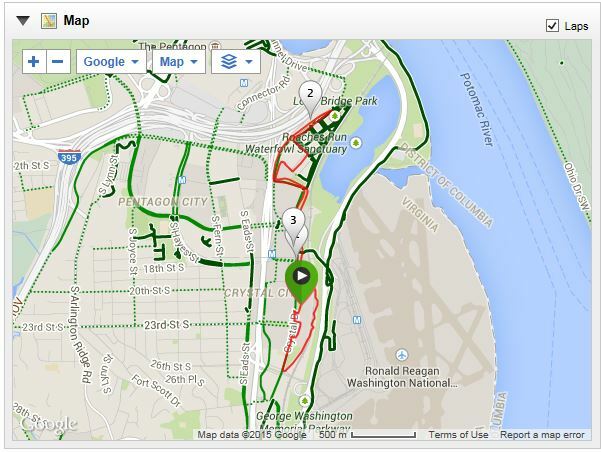 I finished the race in 30:49, or 9:34 average pace but my Garmin also clocked 3.22 miles. I have to admit, charging past the runners at the end was a rush I wasn’t familiar with but loved. That meant I had just executed a perfect race strategy: hold off, speed up, charge. I decided these races would be intended to practice that strategy. Between the first and second miles. Just like last week, the rush to get off work, get home and change, and get to the race was a struggle. The race directors are pretty adament about an on-time start since they only get police and course support for a limited time. Kristine made it to the course with only about 6 minutes to spare, and I was getting nervous I’d have to run without her. Tonight’s weather was almost the same as the prior week: could rain any minute and warm-ish but too cool for summer clothes. I was wearing a tank and arm warmers and felt cold, especially when it started to sprinkle on the way to the race. But once I was out there and running, I was almost too hot. This is why arm warmers rock. The crowd for the second race was a little larger than the previous race, and this was pretty apparent as the group ran around a sharp corner to loop behind a cluster of buildings. The bottleneck choked almost every single runner who wanted to gun it. Plus, the course is friendly to those with canine running pals and jogging strollers as well as several running groups who all make it hard to pass in a small space. Luckily, the bottleneck happens in the first mile when I decidedly would go slower than the rest of my race, but I was almost running too slow to come out with a good time. Even when my second mile was clocked an entire minute faster than the first mile, I still managed to finish the race only seconds faster than my previous time. Like I said, it’s hard for me not to take a race seriously. I didn’t execute my newfound race strategy as well as I did the first race, but it was still a pretty solid tempo run if nothing else: 3.26 miles in 29:35. Another good time and pace that will see the injustice of an incorrect course length. Oh well. This week, Kristine couldn’t join me, so I roped in my friends Katy and Jodi to run with me. The evening was the warmest of the three weeks so far, and the park in Crystal City had literally exploded with flowers from the prior week. Rain, again, was threatening to fall at any moment but I didn’t think it would actually arrive. The race crowd had swelled to over 1,400 runners and it definitely felt much more crowded. Katy, Jodi, and I were almost nearly late to the race, so we started in the back. I had decided I wanted to try for a faster race than in my previous weeks, but I should have elbowed my way to the front. The bottleneck that occurs when the course wraps around the buildings before turning the other way down Crystal Drive in Arlington didn’t let up until we were all out on the streets. I had been running a fairly easy 9:30 pace within the first quarter mile, but soon dropped down to around 11:00 because there was just nowhere to go. People running in groups, with their dogs, with their strollers, and the sheer crush of people in a driveway’s width of space rendered a PR impossible. Note to self: go up to the front to run faster. About a third of the way through the second mile, the warm 80-degree day started to hit me and I could feel myself slowing down with the heat. I pushed harder, trying not to slow down but I was wishing I had brought my small bottle with me. I usually bypass the one aid station along the course, but this time, a swallow of icy cold water was just what I needed. I rounded the tight turn-about and headed back into Crystal City, slowing down just enough up a slight hill to conserve energy for a fast close. Suddenly, I felt it on my arm then again my collarbone: the cool, unmistakable drop of rain. I would only run about another 600 feet when suddenly, it really started coming down. It felt glorious. I don’t usually run in the rain, not because I don’t like it; I just never planned to. And finishing a 5K in the rain was exhilarating. Katy and Jodi finishing in the rain! Dark skies and bright flowers. Unlike the previous three races, I wasn’t able to get off work early to make sure I had enough time to get to the race course by 6:30. It usually takes about 45 minutes to get home by Metro, and 6:15 was when I was due to meet Kristine. I sped-walked to the train station and luckily got on trains that moved fast. Considering how defucnt DC’s transit system is, this was indeed fortunate. I got home just after 6PM, thanks to my speed-walking, quickly changed, and ran down to the park. Going into this race, I was nervous about a nagging misalignment injury— the same one that plagued me during Minneapolis and Chicago Marathon training– but I’d been doing barre and Pilates exercises all week and the injury felt minimal. There but minimal. Because I was planning a long-ish run for the weekend (the Frederick Running Festival is in two weeks), I decided I would just run a casual, easy 5K. And I wanted to run it with my friend. This week’s race was the most crowded– over 1,500 or an additional 400+ runners from the first week’s race. Kristine and I elbowed our way to the front where the bottleneck was generally amongst running partners. At some point, I felt more like I was trotting than running– just trying not to step on the heels of other runners while maintaining the 9:14 pace. Going behind Crystal City’s buildings, where the usual choke occurs, we were able to move along with the crowd pretty well. I could feel myself speeding up, so I just went with how I felt like running. The evening was much cooler than previous weeks– it actually felt like fall. By the time I got out onto Crystal Drive, I could feel that I wanted to charge this course. I don’t remember deciding to run hard– I just felt it in my legs. I could tell at various points that I was going to set a course PR: the leaders didn’t loop past me until about the 1.25 mile mark where I’d previously seen them just after the first mile marker; I was already at nearly 3 miles when I saw the sweeper car. I looked down at my watch and realized I was running a 7:55 split, which is really fast for me. I thought, Gotta slow down– you’re going to burn out in the last mile! But my legs were doing the running for me. Up top, I was breathing HARD. I was nervous about my heart and got a few small rushes of adrenaline at the thought of a freak cardiac episode. I was working really hard and holding a pace over a mile that I was only used to running in quarter-mile bursts. My last split was hovering around 7:48. Right about this point, the crowd was getting thicker so I listened to their cheering and shouts of encouragement and just tried to run my last split hard. But oh, man. That one hurt! I set a course PR with that race, but not an overall PR. What a difference four weeks makes! I survived all four 5K’s! Great recap! I enjoyed the first two races and unfortunately I had to miss race #4 (missing race #3 was planned). Good to hear that the overage was consistent. I can’t imagine what an additional 400 people looked like…. must have been crazy with all the strollers and dogs.